Huawei sub-brand Honor 10 was unveiled globally at an event conducted in London on 15th May 2018. The gadget brings a good look in terms of design and bundled with advanced and impressive specifications, however, it is facing tough competition from OnePlus 6 which was launched on 16th May. 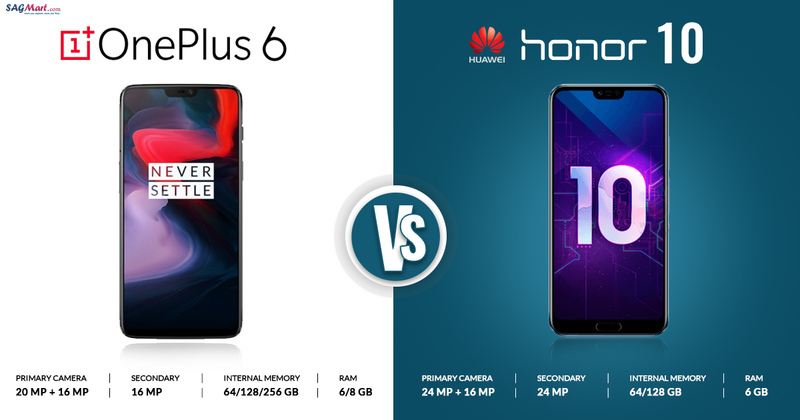 It is well known that Honor and OnePlus both are famous to render powerful hardware specs in their latest offerings at reasonable prices as compared to other companies like Apple and Samsung, but how they compete with each other? The high- end Honor 10 has an impressive design in terms of looking developed with 15 layers of 3D glass on the rear panel of the gadget. In the UK, it is available in two color options: Phantom Blue and Glacier Grey. On the rear panel, Dual cameras are positioned horizontally in the top left-hand side of Honor 10, whereas the Honor logo is visible on the bottom side of the gadget. Huawei has managed to offer full-screen display in Honor 10 with a small notch on the front and an oval physical fingerprint sensor at the bottom edge. The dimensions of the Honor 10 are 149.6 x 71.2 x 7.7mm and weight is 153 grams. A 3.5 mm headphone jack is available on flagship Honor 10. On another hand, OnePlus 6 also has dual rear cameras but it is positioned vertically in the centre followed by an LED flash. An oval-shaped fingerprint sensor is positioned underneath the dual cameras and below that OnePlus logo is visible on the rear panel. The dimensions of OnePlus 6 are 155.7 x 75.4 x 7.75mm and weight is 177 grams, which clearly indicates that it is slightly bigger and heavier as compared to the Honor 10. Flagship OnePlus 6 also comes with glass body on the rear panel, even a display notch on the front side and a 3.5 mm headphone jack as well. The recently launched OnePlus 6 flagship smartphone comes with water resistant feature which is USP for the Chinese smartphone manufacturer, however, this feature is missing on the Honor 10. The Honor 10 boasts a 5.84-inch IPS LCD display, 19:9 aspect ratio, screen resolution of 2280 x 1080 pixels and 432 ppi pixels density and also has a notch on the top of its display. Now coming to the OnePlus 6 features a 6.28-inch Super Amoled display and of course its display is bigger than the predecessors OnePlus 5T and OnePlus 5. OnePlus offers the Full HD+ resolution in OnePlus 6 instead of Quad HD or Quad HD+ resolution that other smartphone manufacturers are offering in their latest flagships. As mentioned above OnePlus 6 offers a screen resolution of 2280 x 1080 pixels which is similar to the Honor 10. 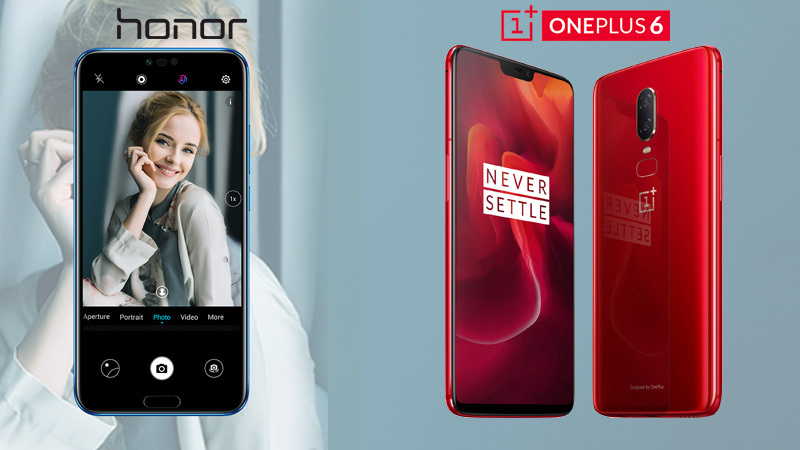 Flagship OnePlus 6 comes with a 401ppi pixels density, however, Honor 10 features a 432ppi pixels density. 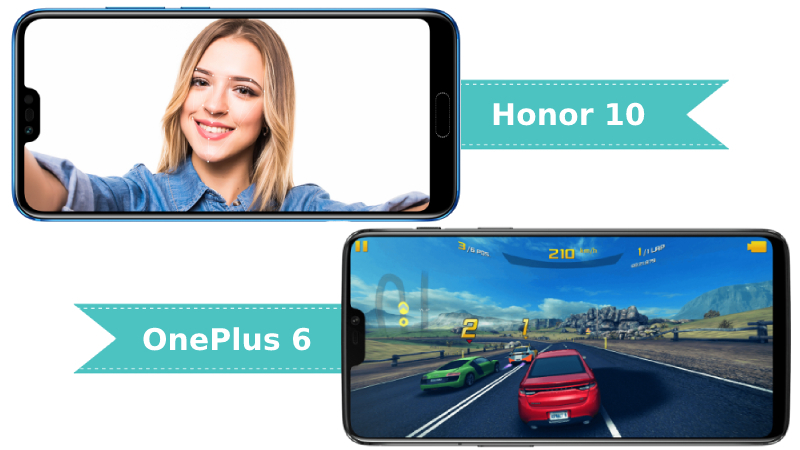 Shortly, Honor 10 offers sharp display rather than OnePlus 6. 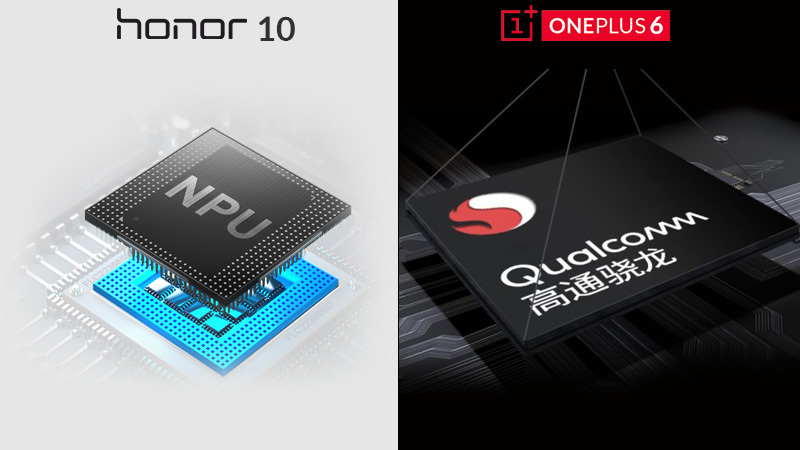 The OnePlus 6 edges out the Honor 10 in terms of hardware but the Honor 10 promises slightly more battery backup. While the Honor 10 is powered by the Kirin 970 processor coupled with 4GB of RAM and 128GB of storage, some regions other than the UK may also get a 6GB Variant. None of the variants offer MicroSD Support. The dual-sim phone Powered by a USB Type-C 3400mAh battery, the Honor 10 unlike OnePlus 6 supports supercharging. The finger sensor is placed on the front. Face Unlock feature comes as standard in both the phones. In contrast, the OnePlus 6 is run by Qualcomm Snapdragon 845 in 6GB or 8GB of RAM option with 64GB and 128GB (up to 256GB of storage). The OnePlus 6 like its counterpart does not support microSD. The power responsibilities are performed by a 3300 mAh capacity battery. The fingerprint sensor is placed at the rear. There is dual sim support too. Honor 10 has a 24MP and 16MP dual rear camera setup. On paper it seems, the Honor wins the battle of the lenses. While Honor’s dual cameras are AI 2.0 technology powered and boast of a f/1.8 aperture. The rear 16-megapixel has RGB color sensor equips Honor 10 to distinguish up to 500 real-time scenarios in 22 categories. In addition to this, 24-megapixel front sensor is equipped for 3D facial recognition, face optimisation and detection with pixel length accuracy. Bokeh Mode and Studio Lightning remain premium attractive features that would lure camera lovers. On the other hand, the OnePlus 6 in line with the OnePlus 5T packs in a 16-megapixel rear and 20-megapixel front sensor. Additional features include OIS, Face Unlock Feature and a larger main sensor with Portrait Selfie Modes. While both devices have Android 8.1, both devices run on custom-built software. The Honor 10 runs have EMUI 8.1 software with an appeal and feel different from stock android. Whispers get louder with easy talk that also reduces background noise to the minimum. The OnePlus 6 runs over the top customizable OxygenOS. True to its brand, the OnePlus 6 has features gesture controls, Gaming Mode and host of customization options. These promise a user experience poles apart than the one on the Honor 10. Further, support for Android P beta renders an added advantage. Overall, we can say that the two premium offerings are pitted neck to neck against each other. However, the OnePlus 6 with its slightly costlier price tag does offer a brand value. This set apart, the Honor 10 is worth all the money and even more with its AI tricks. The more powerful dual camera setup and larger battery further till the battle in its favor as far as features are concerned. 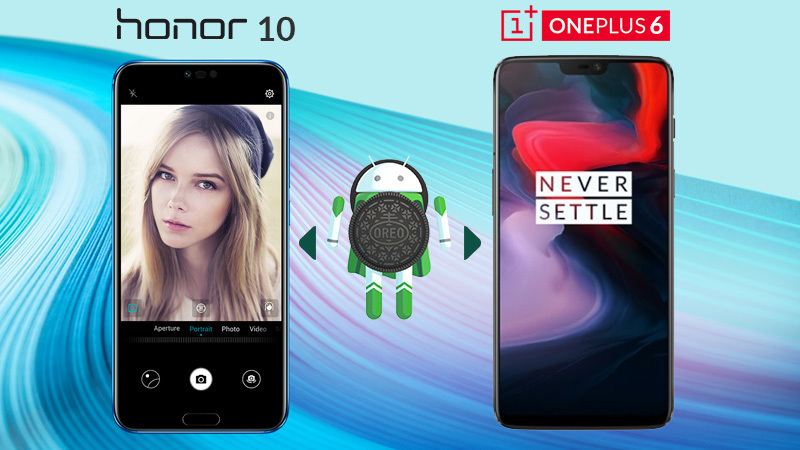 However, the OnePlus 6 offers in addition to its lovely design and unmatched user experience, edges its rival the Honor 10 in performance ratings. OnePlus 6’s Qualcomm Snapdragon 845 with 6GB or 8GB RAM and three memory options is a clear winner in this regard. Hence, both phones offer great value for money with contrasting performance and feature options. Phone lovers should not have a hard time to chose the one that best fits their need. Oppo F7 vs Vivo V9: Which One is Better? Samsung A8 Plus vs OnePlus 5T: Which One is Preffered?